The second half of a podcast of Nicholas Kristof's IF presentation has been released, the 11th in a series of audiocasts available from the ideaFestival. A feed is available on IFblog. You may also visit the podcast page on the IF main site or use this iTunes link to listen. For a small sampling of blog posts about his presentation see this Wired piece and Ethan's write up of what Kristof said, as well as what a panel on which Kristof participated had to say about the nature of peace. Here are some more ideaFestival related links. If you've found others, pass them along in the comments or just email them to me - I'll drop them into the syndicated stream. The generally daft blogging you've come to expect from me will resume shortly. Video from the Do Tanks, as well as video of Craig Nevill-Manning, who is responsible for much of the engineering behind Google search, has been made available by the agents at Geek Squad. You may find all their clips on YouTube. One of the ever-present volunteers in orange who made the events run so smoothly also took some time to blog Ray Bradbury and more. That's going above and beyond. Bruno Giussani at Lunch-over-IP offers some IF love. Thanks Bruno! I've already referenced Wired's work from the ideaFestival, but the entire index, including three posts on Chef Homaro Cantu, is here. The Louisville Courier-Journal has more on Woz. And lastly, My Loueyville's brain explodes. Sadly, it's an all-to-common end to an uncommon three days. Georgia Popplewell, who along with Amira Al Hussaini I had the great pleasure of meeting in Louisville, has made a terrific photostream available at Flickr, which includes the picture above of an unfortunate struggle over an iPhone in Louisville. The iPhone was uninjured. Thanks Georgia for using creative commons! 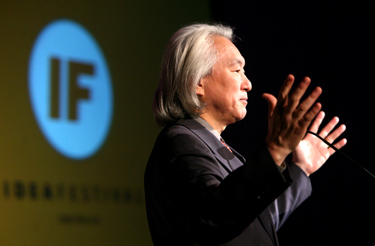 Having seen Michio Kaku, Brandon Keim at Wired Science wonders about an imminent Rapture of the Physicists. Peter Ha at Crunchgear points out that it really was possible to meet the Wizard, Woz, in Kentucky and offers his own photo proof. 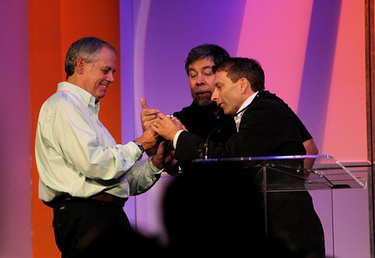 My friend and entrepreneur Rob May - aka Businesspundit - offered his thoughts on Wozniak as well. 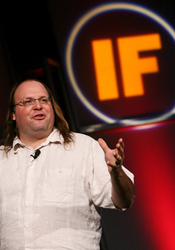 Evgeny Morozov blogged Ethan Zuckerman's articulation of the Tao of the 'Net, or "Why peace, love and international understanding are harder than it might seem." Evgeny also covered environmental artist Ned Kan, fashion designer Karen Walker and the presentation on swarm robotics by James McLurkin, a posting that wound up being Slashdotted. Being much too busy blogging as well, I didn't meet Evgeny. It's my loss. Finally, Steve Hardy, who I thoroughly enjoyed meeting and who edits one of my favorite blogs, Creative Generalist, muses on the conference, Louisville and bourbon. Thanks, Steve, for coming to town. I hope to see you again! 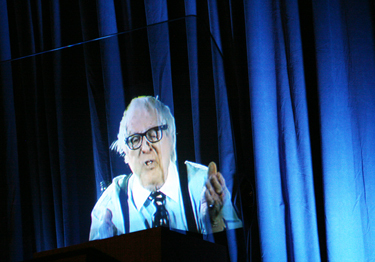 Ray Bradbury greets the audience, saying he fell in love, and with his loves changing, he met many fortunes. He's preserved these loves all his life. In 1939, he saw Buck Rogers and "he forced me to jump into the future and I never came back. He loved the drawings and illustrations of Mars that appeared in books and periodicals. In his twenties, he began to write short stories about Mars. He said he always wanted to be a playwright. Instead of going to school, he went to the library. To this day, his favorite place is in the center of a library, surrounded by the great writers in history. From the age of 12 he's written everyday of his life, he says. "Be your own person. Don't listen to anyone else. You must love what you do and do what you love." He says that he learned to "get rid of anyone who doubted me." His first stories appeared in "Weird Tales." Writing "is what I loved. That's the thing that I must tell you over an over." All these things he learned in the library, he says. And "be careful to whom you listen." He explains that through the years "he wrote his Martian stories" his young wife supported them. He told the story of traveling to New York City and talking to a prospective publisher, who suggested to him that he might want to weave all the Martian stories he had written into a tapestry and call it the "Martian Chronicles." He stayed up all night to put the material together into an outline for his prospective editor, which paid him $700 the next day. On that very day, he sold the Illustrated Man to the same buyer for $700 as well. He told a story about running to a carnival to see "Mr. Electrical" and the "Illustrated Man" at the age of twelve, "exchanging philosophies" with the people who worked there, one of whom believed that the young boy was the reincarnated comrade who had been killed in World War I. He also recounts the story of writing Fahrenheit 451 over a period of days in a library "to protect that library" - he said he worried about Hitler's burning of books. Having given us examples of all his loves and where they had led he said, "jump and build your wings on your the way down." Answering questions, he said Edgar Rice Burroughs was the inspiration for his Martian stories. "Once you know how to read and write, you know how to think." Dr. Jeffrey Schwartz is taking the stage. He is the author of The Mind & The Brain. He explains that he got interested in the question of the mind a long time ago studying philosophy at the University of Rochester, preparing for a career in psychiatry. There is, he says, an overriding philosophy that materialism can solve all problems. If you don't believe that intention has an effect and that "you-as-you don't have anything to do with results," then what can be done in psychiatry is limited to medication. 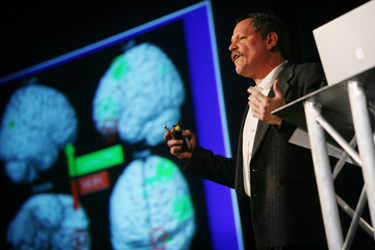 The relationship between the mind and brain, in the 21st perspective, is changing. A scientifically-informed opinion will show how, in fact, the mind does affect the brain. In obsessive-compulsive disorder, his specialty, brain scans reveal areas of the brain that turn on and don't turn off. The brain gets stuck in gear. By reframing how you understand what is happening, coping mechanisms come into play. That has now been mapped. Cognitive reframing has a big effect on the brain by lowering negative emotion. One can quite easily train people to reframe in response to upsetting pictures, and he demonstrates how in his research that has happened. This is a major change. Reframing "markedly, radically" changes how the brain responds to the scene, and, in fact, college kids can do this after only couple days of training. What happens is that the frontal cortex area is activated and a marked decrease in fear in the brain is observed. He recommends a book, "The Mindful Universe: Quantum Mechanics and Participative Observer." Perhaps the mind and the brain are one and the same. "Mind and matter are present in the world." "The brain puts out the call, the mind decides whether to listen." The brain will respond in an animal-like way, but the human mind has the capacity to focus a very special kind of attention, one that can change or damp down damaging or fearful responses. Question: How do you cognitive therapy techniques to make more permanent the positives? He answers "practice, practice, practice." Is the mind a part of the brain or is it a separate? One quote: "The brain doesn't create consciousness, but perhaps modulates the consciousness that it receives." He believes that prayer and meditation can be used to help with the reframing. Maintaining a positive perspective, that, whatever may be occurring in this fearful situation, things can work out, can help. "Ramping up" the expectation "that we have control" can be helpful as well. This has been a fascinating talk that I'm certain my notes don't capture adequately. The speaker now is theoretical physicist Michio Kaku. He holds degrees from Harvard, UC Berkeley and has offered a foundation for modern string field theory. He has authored "Hyperspace," "Time Warps" and "Parallel Worlds," popular books on physics. The presentation starts with a thumping video of the city of the future. In 2057 the video says we'll all live in a wired world full of ambient technology. Michio Kaku takes the stage, pointing out to laughter that the list of 100 smartest people he is on (mentioned in the introduction) also contains Madonna. "Prediction," he says quoting Yogi Berra, "is hard to do, particularly about the future." Now, in this point in time, there are opportunities available to recent generations. Poking fun at physicists, he tells a joke about a priest, a lawyer and a theoretical physicist, who are about to face the guillotine. The priest is spared by a miracle and the lawyer by justice. The physicist last words were that he knew little about God and the law, but he knew one thing. "If you look up you'll see the rope is stuck on the gallows." Kaku's journey to physics clearly involved a lot of experimentation, including building a homemade atom smasher that blew out every fuse in his home, prompting his mother to wish she had had a basketball player for a son. The next year, the largest atom smasher is turned on Switzerland. It is 27 kilometers in circumference. Hopefully that smasher will reveal that we in fact live in 10 dimensions or more. "Today we'll talk about creating a baby universe in a laboratory." We know that our universe began 13.7 billion years ago. We have the embers of the Big Bang; he shows a photograph of the universe when it was only 300,000 years old. The universe is largely made out of Dark Energy, 23 percent Dark Matter, 4 percent Hydrogen and Helium, .03 heavy elements like you and me. Dark Energy is blowing the universe apart, he says. "The universe is not only queerer than we suppose, it is queerer than we can suppose." Recounting the experience of the discoverer of pulsars, who made the mistake of telling her graduate adviser, who took all the fame about her finding, Kaku says that if anyone in the audience discovers what dark energy is, "TELL ME FIRST! I'm a generous man." The universe is undergoing continuing creation. "Our universe is a soap bubble, which is expanding and there are other 'soap bubbles' out there." He briefly explains the four forces of nature - gravity, weak nuclear force, electromagnetic force and the strong nuclear force. In the beginning these four forces were one. He believes the string theory is particularly satisfying because it has a beginning, as mentioned in Genesis, as well as the timelessness of Buddhism. Gravity holds you and me together. The electromagnetic force has led to the Internet and unimaginable communications options. He quickly runs through a number of home and portable devices that will intelligently keep us connected. The nuclear force holds atoms together. Instead of memorizing all the particles he had to memorize, in the future, he hopes that PhD students will simply say "string theory." He describes the "strings" in the theory, which can instantaneously change and construct something new. All the particles he had to memorize are nothing but musical notes on a "rubber band." "The Mind of God is cosmic music resonating through 11 dimensional hyperspace." "The universe is expanding" it's true. "It's expanding into 11 dimensional hyperspace." And like a fish out of water, we spend all of our time in three dimensions. Dimensional thinking also has a literary history, citing the book Flatland. It also has a visual arts past. In Medieval era it was believed that a God's eye view demanded two dimensional figures. Da Vinci brought a third dimension to art in his pieces such as the Last Supper. Picasso and Salvador Dali painted time, the fourth dimension. "Well If time and space can have higher dimensions, can they be bent?" An Oxford mathematician wrote physics masked as children's literature, he says. His name was Lewis Carroll. Like Carroll's imaginary world, the shortest line between two points is NOT a straight line, but a wormhole. How do we test these theories? The Large Hadron Collider will be turned on; he hopes that it will reveal much. In 2011 NASA's LISA craft may take a snapshot of the moment of creation and "maybe an umbilical cord to another universe." We will need to escape in the far distant future, but how? Every few minutes Gamma Ray Bursters are being created. Showing a picture of the black hole, the math indicates that perhaps there is indeed a Looking Glass. Holes in space may be accompanied by holes in time. He describes types of Civilization as Type 0, carbon-fuel burning one, like ours; Type 1, which controls the power of an entire planet; Type 2, which controls the power of an entire star; and Type 3, which controls the power of an entire galaxy. Given a Star Trek example, the crew of the Enterprise are examples of a Type 1 civilization, the Borg are a Type 2 civilization and the "Q" are Type 3. He believes that our civilization will become a Type I civilization in the next 100 years. The movie 2001 realistically depicts what an an encounter between ours and a Type 3 civilization, he says. Ending with and Einstein story, he recounts how the professor, who had grown tired of giving the same presentation over and over, took up the offer of his chauffeur to give it instead. Taking a question at the end of the presentation the chauffeur, who had donned a whig, insulted the questioner by saying "that question is so simple, my chauffeur can answer it!" In answering a follow up question, he says that string theory was discovered too early and is too undeveloped to be used to understand Dark Energy yet. How Flat is the Internet, really? How flat is the Internet, really? This morning's panel, Global Voices bloggers Ethan Zuckerman, Amira Al Hussaini and Georgia Popplewell will address that question. Ethan leads off with the suggestion that technology is not a communications cure-all. Showing a VAX, he says he learned to program on it. He could use the machine with USENET. He describes a prank email from what appeared to be Soviet Premier Constantin Chernenko in 1984. Many people, however, were excited that they could potentially connect to anyone. How global is our information? It's possible to know what is on the mind of people by reading web logs. Showing a picture of the Earth from space taken at night. The planet is partly lit by electricity. And there in is a problem. Clearly there are large swaths of the world without power, and without power there aren't writers with access to the Web. A single fiber strand, he says, connects Africa to the Web. He also shows a colored map. Two dozen countries block access altogether. Aside from physical and political barriers, there are also attention maps Ethan has been working on. Countries represented in blue are, simply put, not part of the discussion in the media. A friend, Kwame Appiah, has a book out called Cosmopolitianism, which raises the question, what does it mean to be a global citizen? We're more connected than ever. Ethan, however, politely disagrees. He talks about the problems and challenges of Nigeria. It has wealth. But most people associate Internet scams with the country; the scam most often encountered actually dates from the year 1588, used by Spanish prisoners. The scams have also spawned a cottage industry of spam baiting, with the ultimate goal of humiliating the scammer. The videos he shows are pretty funny, but there really are no winners. He also describes the very real economy in a South Korean MPOG called "Lineage." Unfortunately, there is a war going on, with Koreans virtually killing Chinese merchants. Our behaviors, our prejudices, Ethan says, transfer. Why is the important? Well there are very real world problems that require us to talk with each other. China and the United States must talk about global warming. If we want to leave Iraq without it being a disaster, we have to talk to Iran. The good news is that there are people who want to build those bridges. Ethan shows the blog of a Saudi man called Saudi Jeans. Turns out he's an ardent feminist, mostly because places where he might meet women are very limited. He argues on his blog for a woman's right to drive. Ethan points to a U.S. Chinese blogger who translates Chinese blogs into English. Rather than saying certain banned words, Chinese bloggers have become very creative with puns. 70 Million people of around the world talk using blogs. "You need a guide to these voices." With that, Ethan introduces Georgia Popplewell and Amira Al Hussaini. Georgia talks about her experience getting trackbacks from Global Voices to her blog, which led to her becoming a volunteer author. She did that beginning in 2005. She is currently the managing editor for Globalvoicesonline.org. She recounts the early history of Global Voices, which was founded in 2004 by Ethan Zuckerman and Rebecca MacKinnon, Fellows at the Berman Center for Internet and Society at Harvard Law School. There are two managing editors. The co-managing editor lives in New York. There are 20 regional language editors, two tech guys, one outreach director, one advocacy director, 100 plus volunteer authors and translators. "Global Voices aggregates, curates and amplifies the global conversation online - shining a light on places and people other media often ignore," according to one slide. The volunteers give content. Regional editors serve as a check on the credibility of bloggers. She explains that Global Voices has also undergone a transition from English-only to being published in many other languages. The articles run the gamut, just like other blogs. Georgia demonstrates how to search Global Voices and to provide comments. Running a bit short on time, Amira provides an overview of her work with Global Voices and offers her perspective as an Arab woman on what she sees and hears. Here are some IF posts I found this morning. Enjoy. Georgia Popplewell, who will be presenting this morning on the panel The World is NOT Flat, made this picture available at Flickr of Architecture for Humanity founder Cameron Sinclair during his presentation, "We Don't Ship." Thank you Georgia for using Creative Commons! Ryan Butkowski at Geek Squad could personally relate to what Steve Wozniak said last night. Wired published Why Do Smart People Do Stupid Things? and Visible Invisibility and the Fifth State of Matter, which was the session with Ned Kahn, one of my favorite presenters. I'm hoping my family can get over to see his work at 21c in Louisville. Please don't forget to check out Creative Generalist Steve Hardy, who I've enjoyed getting to know a bit here in Louisville. 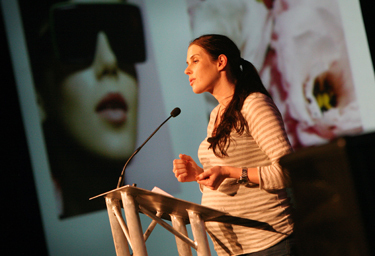 Daily EM wrote up Karen Walker's presentation on the meaning of fashion and also covered Kahn's presentation, linking to the YouTube video here. That is not fabric covering the building, but many thousands of tiny panels arranged on a grid. James McLurkin is speaking. The title to his presentation is "Dances with Robots: The Story of One Engineer, 112 Little Robots and the Toys, Insects, and Star Wars Movies that made it all Possible." He begins lightly with the three laws from I, Robot and suggests to laughter that robots don't care. They can't read the rules. He asks three questions to begin. What is intelligence? Would we know it if we encountered it? He says that we don't know exactly how to define intelligence. Do we attribute intelligence or is it something we possess? Offering himself as proof, he says intelligence can arise from the interaction of unintelligent components. No, he says, we don't know how it happens. Does intellect need a body? Probably. Intelligence doesn't just happen in the brain. He cites military and Mars rovers as two of his favorite robots. The military robots save lives and the Mars rovers endure extreme circumstances. Swarm in Nutshell. He spends his time working on multi-robot swarms, hundreds at a time. How can we get them to cooperate? They can tackle the dull, dirty and dangerous jobs and cites several examples, like finding earthquake survivors, where they would perform very valuable services. What if we sent 200 instead of 2 robots to Mars? In his first demonstration, he shows how they might move away from the lander and form up to go somewhere. Seven depart for a different location, leaving a few behind. Giving a command, he sends the remainder to join the first cluster. He then spreads them out to the sound of music, having them flock toward a point on the stage. One of the biggest problems, he says, is figuring out how the group can define boundaries so that they remain coherent. Each robot is sharing information with infrared transmitters so that they can stay together. The shared information contains location information. They can also relay information among themselves to send alerts or to dynamically react to events. He next has the robots orbit around an important find, perhaps a newly-discovered Martian fossil. To leave the Red Planet the robots line up behind the highest ID'd robot. The lowest designated robot brings up the rear and the whole blinking convoy proceeds toward a landmark, perhaps a recovery ship. Much of his inspiration comes from the insect world, which exhibits complex group behaviors. There is a couple of hundred years of biological observation to draw on. Discussing Honey Bees he calls it "Beeware." Other insect software can be derived from ant scent trails used during foraging. The "magic of complexity" arises from local interactions, which develop into complex group behaviors. He then breaks down each bot into its parts - radio, camera, and IR inter-robot communications. The equipment is used for activities like "directed dispersion," a maneuver useful for finding hidden objects. McLurkin's humor is winning. He has a very outgoing personality. Having covered distributed algorithms, he asks for four women and four men to come forward and warns them "not to kick the robots." Facing the audience, each person holds up a card with a number. He asks them pair up and to average their numbers, seek out another partner and re-average. Group and repeat. Group and repeat. He explained how this was an example of a distributed algorithm. One person asks how, if the ants find through scent, do robots do similar things? The answer is synergy and it's difficult to code. How to take implicit cues from the environment is something he wants to explore later in his career, he adds. Each person ends up citing the correct pair-wise number. By computing successive pair-wise numbers, the group moves toward the mean. The resulting numbers will always wind up in a tight range. This is very useful if all the numbers aren't known, or if you don't know what a number is. This is how honeybees share food. The may make an effective local decision based on global data. 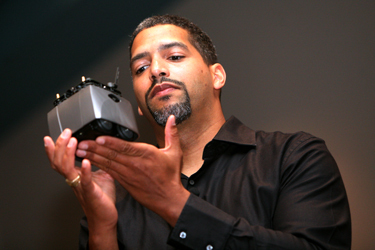 McLurkin recounts how he became interested in robotics. Cardboard boxes are great for building stuff. Model railroading taught him precision crafting. LEGOs taught him mechanical engineering. Pac-man taught him computer science. A video game is a complex piece of coding. MS Word will never tax your machine, he says. BMX bicycles taught him real mechanical systems. As he got older radio control cars from the hobby store taught him more about mobility and how, he adds, to avoid heavy, ankle-damaging radio control cars. He details his undergraduate and graduate work quickly and then proceeds to his second robotic demonstration, which he dubs the "Martian band." The group begins to slowly beeping and chiming, syncopated at first, and then later, in time. The group then reforms to into like groups, much like a symphony. Together they play the Star Wars theme. And with that, he concludes. "Embrace the volatility" - The fashion business is volatile. And "sometimes the only support for your conviction is the conviction with which you say it." "Ignore the rules" - Don't pay attention to the leading voices offering their thoughts. Plunge ahead despite the fear because "you'll never be ready." She says the isolation and newness of New Zealand contributed to her work. Her country gave women the vote in 1893 and "Getting off it" and "on with it" is part of the culture. Like Craig Nevill-Manning who spoke earlier and is also New Zealander, she references the idea that with a "'number 8' wire approach" you can do anything. "Everything inspires" - Inspiration can come from anywhere, which is important since the industry starts new every year. To prove her point, she runs through several images of her work from initial idea to finish. They're informed by cultural references mined from 1950's teen movies to the mannish styles of Diane Keaton to the pioneering spirit of Amelia Earhart. She repeats that inspiration can come from anywhere, which is similar to the IF motto that the "answers are everywhere." "The test of new work is whether it makes the creator nervous..." "It might be wrong, but it just may be right." She references words she heard from Bono on the moment of creative triumph. He described it as "when God walks into the room." "Know your style" - For her it's "having the right amount of wrong." "Know your customer" - It's "people like us." She explained that she will never do market research. "Surround yourself with people with who will support you" - If she has to explain it for more than two minutes she'll drop the engagement. "Building a brand is like building coral." It's a slow process, the eye can't see it, but one day you look up and you find it's beautiful. During the Q&A, she explained how her mother and grandmother always had a sewing machine and a box of fabric around, which really inspired her to think about clothing. Answering a branding question, she said always treat the brand and product as one in the same. Never think of them as separate entities. That's it. I was really quite impressed with her unpretentious and can-do attitude.